The Secretary General of the International Association for the Defence of Religious Liberty, Dr. Liviu Olteanu, talked at the Palais des Nations in Geneva with Her Excellency Ms. Yvette STEVENS, Ambassador Extraordinary and Plenipotentiary, Permanent Representative of Sierra Leone at the United Nations in Geneva. Dr Olteanu invited the Ambassador to join the international platform on «Religion, Peace and Security» launched by the AIDLR and the UN Office for Genocide Prevention at the end of the Global Summit on “Religion, Peace and Security” hosted in November 2016 at the United Nations In Geneva. The Secretary General also commended the strong commitment of Sierra Leone in favor of interreligious dialogue as a good example to be copied internationally by other nations. Photo: H.E. 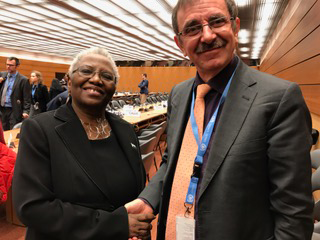 Ambassador Yvette STEVENS, Permanent Representative of Sierra Leone at the United Nations in Geneva and Dr. Liviu Olteanu, Secretary General of the AIDLR.